Many people say – and I agree completely – that the municipal vote is both the most important and, in many instances, the most boring as well. It’s the most important because municipal politics influence and control most of our daily activities, be they road construction, development, planning, real estate activity and value, traffic controls, trustees for education boards and so on. It’s also really boring because campaigns aren’t glitzed up with promises about slashing taxes or elaborate spending schemes. Well, Toronto is an outlier in this respect, given the subway plans that are required for this town (yes, I just said that), but most voters in municipal elections are confronted with worries like flouride & pesticide bans, parking fees and other seemingly trivial issues. However, the KEY issue in all municipal politics are traffic and planning. Cities are no longer being planned, they’re being built without thought. Today, be sure to vote for someone that will do everything they can to avoid turning your municipality into another Detroit. Endless sprawl must end and find the right person who is committed to delivering the best bang for the buck by intensification. And please, for the love of the creator(s), DO NOT vote for someone that promises to run public office like a business. The Cons brought this on Canada. George Bush may have converted 9/11 into a heroic moment which saved his profile – for a short time – but I can’t help thinking that events in Ottawa today are a direct result of the horrifying and misdirected politics of the Stephen Harper Conservatives. Whether it’s a couple of gun nuts blasting away at the public, blow-back from the radicalized Canadians (assuming such a beast hasn’t been manufactured by the MIC) or massive incompetence on the part of our security establishment as a result of spying on Canadians and environmental groups, it’s more clear than ever that the Cons are firmly on the wrong side of history after today. I am disgusted with where this government has taken Canada and the rest of Canada should be as well. The Harper government has invited attack on our soil because of their misguided political agendas. This is a sad day for Canada. The greatest fear I have is not gun toting criminals or terrorists, but that Harper will quickly leverage this to his advantage to eliminate any of the few freedoms that we have left. He will continue his crusade and make Canada an even uglier face in the world of politics. When it all goes down, who does Harper call? 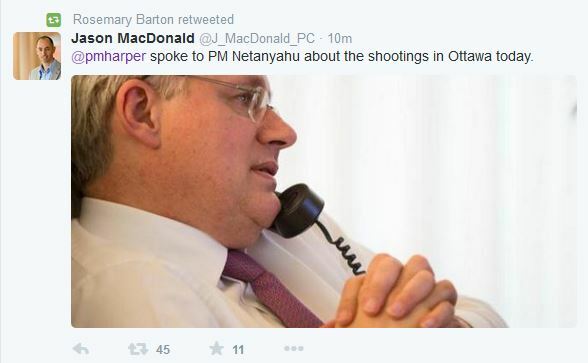 Benjamin Netanyahu, like he’s the frickin’ boss of Harper. Much like 9/11 shielded Donald Rumsfeld’s disclosure of truth about Pentagon spending, today’s attacks in Ottawa will prevent anyone from questioning Harper’s new legislation that will put us all in a permanent state of lock-down. It is a sad, sad day and my kids will one day ask why we did nothing to prevent it from happening. Ottawa’s in lockdown. It’ll probably never truly recover from lockdown. My immediate concerns are for friends and family in the area. I hope they’re all safe at home and comforting each other. If you haven’t heard, Ottawa was ‘under attack’ by an unknown number of gun men earlier this morning. There’s so much to say and ask, but that will happen in time. Democracy is brilliant. Unfortunately, people are stupid. Why else in the run up to the municipal elections would there even be a ‘debate’ concerning specific candidates? But people still flock to their sides, pledging support and damning those that suggest public office should be run by professionally trained public officials. I don’t mind a professional approach to things. In fact, maybe that’s the ‘between the lines’ suggestion from candidates that pledge to stop gravy trains – candidates that don’t take this approach are pathetic, communist slobs? When you pledge to run a city like a business, do you know how many people you’re insulting? Are PEOPLE from other types of organizations not invited to the table? What about non-profits and charities? Firemen and police services? Planners and city workers? Other organizations that don’t fit into your square hole? Are they not professional? Do they not focus on their jobs with care and pride? Or are you simply trying to suggest that as a business, you’re ready to play favourites, enter the grey zone of regulations using public funds, cater to the highest bidder but not necessarily the best provider and sell off anything that doesn’t turn a profit? Or even lose money, like some of the world’s largest corporations have in the past? Or will you be corrupt and vile, like some of the greatest corporate disasters in our history like Enron, WorldCom, the dotcom boom/bust and bankers, all of whom have robbed the average citizens of trillions of dollars in personal savings and real estate? And how will you be accountable to your stakeholders, the voters? Will your first act be one to introduce recall, an important way for the public to remove someone from office once they prove to be inept? How do we fire you if you’re incompetent? And that’s why public office cannot be run like a business. You have to be experienced, accountable, equitable and yes, bureaucratic. The good news is that you’re only one vote of many. C’mon people: put your emotion and libertarian sentiments aside for a few minutes and use the brain you were born with. When you vote next week, please consider experience, knowledge and look at the people that are endorsing the candidates. Municipal Vote Thoughts: Don’t Promise to Run a City Like a Business! A City is NOT a business. The people that use the ‘I’ll run it like a business’ mantra have run too many businesses (probably into the ground or not in Canada) to understand and appreciate that not everyone thinks and acts like a ‘businessperson’. There are bureaucrats. These pockets of people who make our governments work have acquired such a negative tone as a result of decades of right-wing politicians and lobbyists attacking them, but they have an armada of endearing qualities that I actually admire. They are patient, knowledgeable, usually helpful (especially when you treat them like decent human beings), connected, grounded, responsible and passionate about public services. There are social workers. There are teachers and educators. There are employees of the public services, including a diverse range of talents and demands, like police, health unit workers, firemen (and women), garbage collectors (those that haven’t been privatized). There are city planners and developers that must account for different situations that a typical ‘business’ environment may not allow. In my experience, none or few of these people respond well to the authoritarian and controlling dictates of the business-person mindset. In fact, they have chosen their vocations specifically because they do NOT want to work for a large corporation. For those of you who have worked in ‘businesses’ let me remind you that it ain’t pretty at the best of times, so I hope you appreciate what I’m saying. Corporations are simply reflections of people, usually very bad people. As people rise to the top, corporations tend to start to reflect the absolute worst traits that humanity has to offer. Greed. Control. Authority. Inflexibility. Manipulation. Reckless regard for the world around us. Limited Liability. Those that engage in charities only do so because they calculate the marketing benefit to it. If they do otherwise, they’re not a good business. With this in mind, why the hell would I ever vote for someone that promises to run a City (or Province or Country) like a business? What is your public service experience? What is your public service education or training? Describe the different types of groups that you work with and your thoughts on working with unique groups of people. If you don’t have public experience, you really shouldn’t be running for public office. It’s that simple.